My granddaughter was so happy when she opened this present. The quality is good and price was right. With her new quilt and matching sheets on her new bed, she feels like a big girl now. 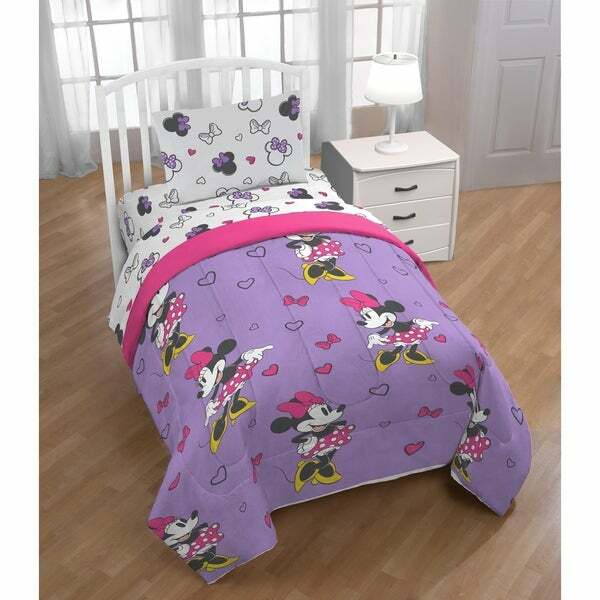 Bring magic of Disney to any child's bedroom with a bold and colorful Disney Minnie Mouse Purple Love Reversible Twin Comforter. Sure to keep you warm, this reversible comforter is stuffed with polyester fill for loft and cozy comfort. Quilt stitching holds fill in place and adds decorative flair. Durable polyester fill is soft, comfy and warm and holds its shape after multiple washings. Reversible design allows you to instantly change the look by simply flipping the comforter over. Twin comforter measures 64" x 86". Additional bedding coordinates and accessories sold separately. Easy care, machine washable.